Clear evidence the Anunnaki, the gods from heaven, are now back on Earth? Ever since Roswell NM when an unidentified flying object crashed onto a ranch authorities have vehemently denied the existence of UFOs and extraterrestrials. Now a whistle blower reveals a United States EKV – Exoatmospheric Kill Vehicle – has destroyed a mysterious UFO orbiting in the Clarke Belt 22,000 miles from Earth. David Rowan a best-selling author famous for debunking UFOs is led into a strange and grueling trek to attend a “Gathering” set up by descendants of the Biblical “giants in the Earth” – the Anunnaki who are now so far evolved they believe nuclear bombs and weapons are passé. Rowan soon finds they are far from mythical and now possess extraordinary powers that enable them to abduct anyone anywhere at any time and also to resurrect the dead. Rowan’s bizarre journey starts in England with strange encounters in New Mexico, Texas, Oregon, Washington State and concluding on a remote plateau in the coastal mountains of British Columbia. As the civilized world falls apart, Rowan and his group desperately seek to reach the summer solstice event riding 350 miles packed in an 80 year-old diesel truck on highways cluttered with wrecked vehicles and looters. Could the events depicted in this strange novel actually occur? The author and the characters on stage believe it is the only way for the human experience. The Return of the Fathers. 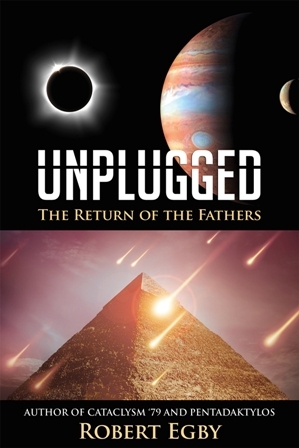 Read an excerpt from UNPLUGGED: The Return of the Fathers. AUTHOR SIGNED BOOKS: Each of Robert's books are available signed by ordering through Paypal. In the instructions explain who you wish the book or books signed for. Each book is $12.99 with FREE shipping in the US. Most orders are mailed the same day as they are received. Thanks.